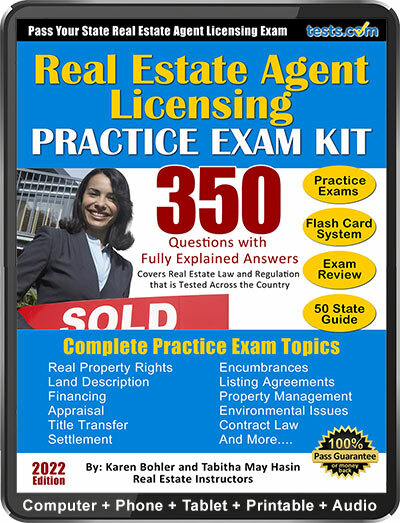 Take this free practice test to see how prepared you are for a real estate agent certifying exam. All states require real estate agents to be licensed by the state to engage in the sale of real estate. The tests cover such subjects as forms of ownership, physical descriptions, valuation and regulation. 1. As a seller's agent, you sell a house for $135,000. The selling price includes the standard six percent commission rate your brokerage charges. The buyer's agent will get half the commission. What is your portion of the commission? 2. The zoning laws in your town require an apartment building to provide two and a half parking spaces for every 1,000 square feet of inhabited space. A local apartment building has 20,000 square feet of apartments. How many parking spaces should it have? 3. The presence of lead paint in a home must only be disclosed if the home is being purchased using an FHA loan. 4. Of the many expenses involved with owning a house, which of the following are tax-deductible? 5. The monthly net income on an investment of $115,000 if the rate of return is 12 ½ percent is _____________. 6. You sell a home for a client where the down payment was $30,000 with a loan of $125,000 at 3.7% interest with a term of 30 years fixed. The mortgagor's monthly payment is $1,219. What is the loan to value ratio? 7. You can only legally receive a commission from your employer. 8. An offer comes in on a house you are listing, but it does not have an escrow check. What should you do? a. Give the offer to your client. b. Call the buyer's agent and tell him you need an escrow check or you can not submit the offer to your client. c. Give the offer to your client, but suggest that she make a counteroffer and ask for an escrow check. 9. The Real Estate Settlement Procedure Act (RESPA) applies to what types of real estate transactions? 11. An agent, broker or lender who is "blockbusting" is trying to scare owners in a neighborhood into selling their property. 12. A buyer is applying for an ARM loan. How do the payments on such a loan change? a. They stay the same over the course of the loan. b. The interest rate changes every year, which can raise or lower the total payment. c. The interest rate goes up every year. d. The interest rate goes down every year. 13. How much time must the parties to a real estate closing be given to review the HUD statement? 14. Which of the following is considered a good balance between the supply of and demand for apartments? 15. You are trying to price a property. Five years ago it was sold for $125,000, but property values in this particular neighborhood have decreased by an average of 5 percent since then. What is the rough value of this property? 16. A homeowner has a mortgage with a fixed interest rate. Under what circumstances would her payments change? a. None; the payment will not change over the life of the loan. b. The property taxes go up or down. c. The cost of homeowner's insurance goes up or down. 17. It is legal for you to work for more than one broker at a time, as long as you disclose any conflicts of interest. 18. Which of the following types of discrimination are prohibited by the Fair Housing Act of 1968? 19. You receive an offer on a listing and an escrow check. Your client accepts the offer. What should you do with the escrow check? a. Turn it over to your broker as soon as possible. b. Deposit it into the broker's account. c. Keep it and write a check to your broker. d. Put it in the file and hold it until the closing. 20. A valid real estate contract must contain which of the following elements? 21. You can only appraise a listing if you are a certified appraiser, unless it is a residential property and you are appraising it for listing purposes only. 22. A basic owner's title insurance policy will cover all of the following except ________________. 23. What must a homeowner in foreclosure do to exercise his right of redemption? 24. Which of the following types of mortgages will probably have the lowest initial interest rate? 25. A woman is deeding her mortgage-free house to her son. Is the deed required to show "good consideration" to be valid in this case? a. Yes, because all deeds must show good consideration to be valid. b. No, because family transfers are exempt from the law. c. Yes, unless she is deeding it to him in her will. d. No, because the house does not have a mortgage and there is no lien holder involved.